The story of the Confraternity of Christ the Priest begins with the story of Australia – a country with so much that is going well, but at the same time, with something not right. At the beginnings of the Confraternity’s history, Australia really had a mission field right here. This is even more true today. Of today’s 22.5 million Australians, around 21.5 million do not go to Mass. Australia is a wealthy, developed country, but it is also a mission field hungry for the Gospel. Australia’s “churchless millions” needed the teamwork of many people who would be free to dedicate themselves to this work. And so began the Confraternity of Christ the Priest. 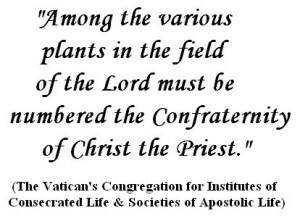 The Confraternity of Christ the Priest was begun to train up labourers who will go out together into the Lord’s harvest of Churchless millions! The Confraternity is based in San Isidore in the diocese of Wagga Wagga, New South Wales. We plan to grow a team of hundreds of priests and brothers to be missionaries to these churchless millions. We are looking for a special kind of person, because the men who join will be entering the Confraternity at an historically significant time in the history of this group of priests and brothers in the Catholic Church. They will, we pray, make an historical difference in this country, and perhaps in others as well. Most groups of priests or brothers or sisters are established to work for a particular group of people. Nursing sisters work for the sick and elderly, teaching orders work for young people. The Confraternity too was founded to work for a particular group, those who have given up all practice of the faith and those who have never known what religion is. 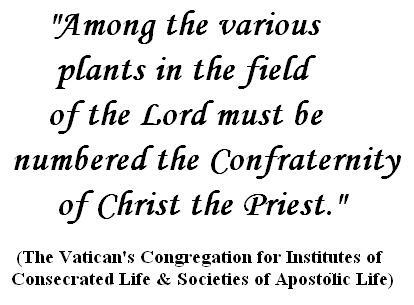 The work of the priests is the Intensive Apostolate – the Confraternity takes on a parish for 25 years and has in the parish not one or two but many priests. The heavy work of a parish priest, on his own and simply serving those who go to Mass already, leaves very little time to think of any missionary work to non-Catholics or lapsed Catholics. But with many priests focusing their zeal for God and souls in a parish, the churchless at last have a better chance. By personal contact with everyone in the area, they aim to influence every individual to believe in God, to love and worship Him. The work of the brothers is to build church, school or other buildings the parish might need, to finance the Intensive Apostolate – working in the monastery, the parish, and, in time, on a farm etc. 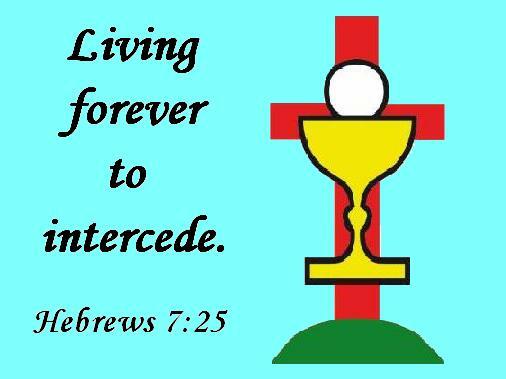 Priests and brothers will work and pray alongside each other to lead souls to heaven. The spirit of obedience of Jesus moves the members to be aware that their obedience to superiors and to the Confraternity’s rule, their will to celebrate the Liturgy the way the Church asks and their love for the teachings of the Magisterium, all these acts of cheerful and willing obedience have a hidden spiritual power and a visible pastoral effectiveness that is too rich to neglect in their work to glorify God and save souls. 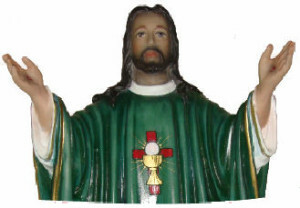 The hearts of the members of the Confraternity too, priests and brothers, are filled with the zeal in Jesus’ heart for the glory of God and the salvation of souls. Zeal is that burning love for God that yearns to see every human heart ardently loving and adoring Him, and that burning love for souls which thirsts to see all people possess their greatest good and their eternal happiness in God. We take our motto from the letter to the Hebrews: “Living to intercede”. This is a reminder to us that we are called to share in Christ’s work of acting as “go-betweens” and “bridge makers” between God and mankind. The symbol of the Confraternity of Christ the Priest is the Host and Chalice set upon the Cross. It is Christ the Priest Who saves the world: He was obedient even unto death upon the cross, and He brings His redemptive sacrifice on the cross to us, and us to the cross, in the sacrifice of the Mass. Members of the Confraternity of Christ the Priest take vows to God of Chastity, Poverty and Obedience, and they live in community. So there is the same kind of preparation that religious all over the world do – novice, temporary vows, final vows. Those who join to study for the priesthood will go to the Wagga Wagga diocese’s Vianney College. What’s unique about the Confraternity’s training? Brothers are trained in Wagga Wagga in a profession or trade to become an electrician, journalist, plumber, architect and so on. Those who are going to become priests are taught to understand and love the teachings of the Church and to celebrate the Mass with devotion of course, but they are taught with particular emphasis about the Church’s zeal for the salvation of souls and about the new Evangelization.